The Intellivox ADC (Analogue Directivity Control) range is intended for use in 70V/100V Public Address and Voice Alarm (PA/VA) systems. As with other Intellivox products the ADC range has been designed to maximise listening comfort and provide highly intelligible speech reproduction even within difficult reverberant spaces. The revolutionary Digital Directivity Synthesis (DDS) algorithm, pioneered by Duran Audio, was used to define a set of passive filters which has been precisely transferred into the analogue domain resulting in the ADC technology. The Passive filter network provides time alignment for the individual drivers, equalisation of the complete array and creates a constant wavelength line source. 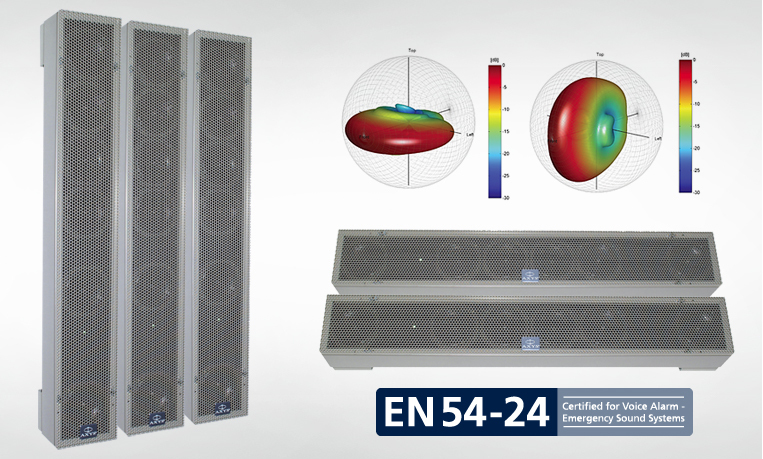 Each array consists of 6 carefully aligned 4” full range loudspeakers housed inside a tough steel enclosure. The specially aligned drivers are highly efficient and have an extended flat frequency response, providing natural and uncoloured reproduction of both spoken word and background music. All Intellivox ADC products are EN54:24 certified.